Debt Consolidation: What is it and is it right for me? If you’re dealing with multiple loans, chances are you’ve heard of debt consolidation (think of those obnoxious radio or tv ads). But what exactly is debt consolidation? Put simply, debt consolidation allows you to consolidate all of your debts into one payment. This will combine all your debt amounts, and it may offer a lower interest rate – but not always. Debt consolidation comes in different forms, including secured and unsecured. If your debt consolidation is unsecured, that means that it is still a signature loan. If it is secured, you have to put up some asset (like a car or house) as collateral – which you are then at risk of losing. Some people use a home equity line of credit (HELOC) to pay off credit cards, but in my book, that’s a big risk and can have many consequences including high costs and even foreclosure if you are unable to pay the debt. There’s a dizzying array of options out there that may help you with your debt. Debt consolidation, settlement, and management all refer to different processes with different drawbacks and benefits. Debt settlement is when you negotiate for a lower rate or balance. Debt management is when an intermediary company negotiates on your behalf with your creditors, then you pay the debt management company and they pay your creditors. What are the interest rates? Use a Debt Consolidation Calculator to check your consolidated rate. Be careful because the rate is sometimes higher on consolidation loans (and don’t forget the fees!). What is your budget? Use a calculator to make an honest assessment of what you can afford to pay towards debt reduction. Do you have an emergency fund? Balancing debt reduction and saving is tricky – but my word of advice is to always put yourself in the front of your line. Saving for emergencies, even a small amount, is a good habit to build. Beyond the many debt consolidation options on the market, I want you to also consider building your own consolidation plan using zero interest cards or short term lower interest loans through a bank or credit union. But as always, make sure you’re still asking yourself the central questions I’ve outlined above. I’ve often seen that consolidating debt actually leads to acquiring more debt: the newly consolidated debt plus new debt from continuing to use credit cards. Here’s where your money mindset comes into play. Whether or not you opt to use debt consolidation, you may need to shift your behaviors to meet your financial goals and to be successful with tackling your debt. You may find that creating your own debt management plan is best for your money AND your mind. 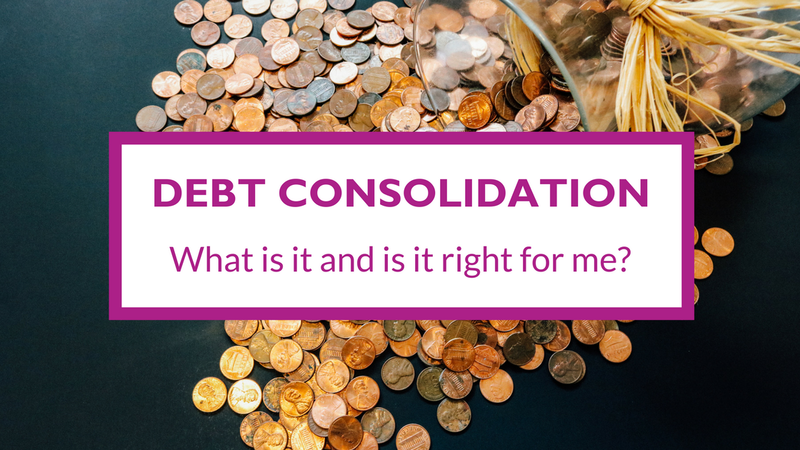 Debt consolidation is complicated, and there’s a lot to consider when deciding if it’s right for you. Nolo, my go-to online resource for legal issues, walks you through some additional important considerations, including a more in-depth comparison of choosing a secured or unsecured debt consolidation plan. Another great resource is this article from the Consumer Financial Protection Bureau (CFPB). Whew! That is a TON of information on debt consolidation. Consolidating your debt is a big choice, and I want to make sure you’re equipped to make the right decision for you.